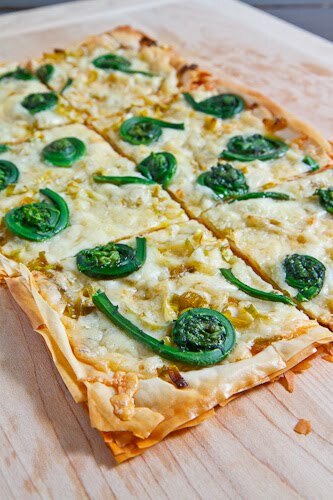 A fiddlehead and leek tart covered in melted gruyere on a light and flaky, golden brown phyllo crust. Another ingredient that is available during spring is the fiddlehead fern and the last few years I have been enjoying experimenting with them. Fiddlehead ferns are young ferns that are picked before the frond has opened. They are commonly used as a vegetable and their flavour can be compared to that of asparagus. 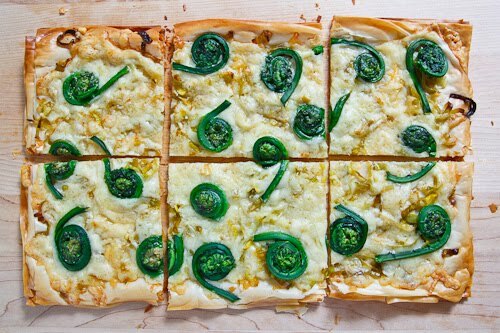 This year I knew exactly what I wanted to do with the fiddleheads, a savoury fiddlehead tart! For the base of the tart I used sheets of phyllo dough and I topped them with some sauted leeks with a bit of garlic and then I covered everything with a layer of gruyere cheese followed by the fiddlehead ferns themselves. I like using phyllo pastry for tarts like this as it bakes up nice and light and flakey and golden brown which is perfect for a light spring meal. Add the leek and cook until tender, about 3-5 minutes. Remove from heat, mix in the lemon juice and season with salt and pepper. Place a sheet of the phyllo dough on a greased baking sheet and brush it with oil. Repeat with the remaining sheets each on top of the last. Sprinkle the leeks over the phyllo followed by the cheese and finally the fiddleheads. Bake in a preheated 375F/190C oven until the phyllo dough is golden brown, about 20-30 minutes. I love fiddleheads and pairing them with nutty gruyere and a buttery shell sounds heavenly to me! I LOVE this. Not only does it look and sound delicious but it is so well executed it looks like a piece of art! I have actually never made fiddleheads. This tart looks like the perfect use to show off their shape. I've never heard of fiddlehead ferns before. But this tart looks fantastic! I think ill try it with spinach! Now that just looks like art, not to mention really interesting. You've inspired me – I'm seeing fiddleheads everywhere these days. What a whimsical vegetable. I've never had fiddleheads and have never even seen them before this recipe. Strange! I wonder where I can find them here in California.. This is beautiful! I've never seen fiddleheads used this way–love it. The tart looks perfect and of course, one can never go wrong with gruyere. Love! So pretty! I'd love to taste fiddleheads. Love it! I always miss the right moment to pick some fiddleheads. I love the unique taste of fiddlehead. Great for Asian stir frying as well. yummy! I didn't do ANYTHING with fiddleheads this year and I'm kind of regretting it after seeing this tart! This tart sounds like it would be a fabulous appetizer for a party! Beautiful! I tasted fiddleheads for the first time a few years ago. They were delicious. I love this idea..looks so good. So beautiful! Growing up in New England I loved fiddlehead fern season – it was so exciting to get to use a new ingredient that I could only get during a small window of time. Since I moved down to DC I haven't seen them! Hopefully they'll still be in season when I make it home to visit my folks in a couple weeks. Thanks for the recipe – I'll see what I can do! LOVE this! So tasty looking. Never had fiddleheads before (that I knew of anyway), but I love Gruyere cheese. Not only does this recipe sound good, but look how you coiled those greens. So cute! May have to try this tart out sometime this week. Thanks for sharing! I too have never heard of fiddleheads- the old adage of learning something new each day is so true- but I live the name and the tart looks AMAZINGGG! Really enjoying reading the blog, thank you! Never even heard of this fern before, how neat. This is almost too pretty to eat. Oh Kevin….. Wow! this looks like something I could eat the whole tart in ONE sitting! I love how you take the most minimal & simplest ingredients & create culinary magic. thank you, thank you. Mmmm… looks amazing! I love fiddleheads and so need to try this!!! Now this I will definitely make! I love fiddleheads and am always looking for new recipes. Leah: Don't shy away from fiddleheads because you have never tried them. Give them a try! You won't regret it. And as Jen says, the nutty flavour of fiddleheads and the nutty gruyere is a perfect pairing. OMG! I love fiddleheads. Do you have any suggestions on where to find them? I haven't had them since my grandmother used to can them when I was little in Northern Ontario. remember to cook fiddleheads really well – no one wants to get fiddlehead fern poisoning. blech. Pj: Yes fiddleheads need to be well cleaned and well cooked but you also don't want to cook them until they are mushy. Your photos and recipes are always awesome but this one is simply beautiful… you've really outdone yourself! What a treat! I've never seen fiddleheads before. Sounds like an amazing creation… I'm off to farmers market then! This is a very pretty tart! I still haven't tried fiddleheads, but I love the way they look. Their perfectly scrolled shape looks amazing on a flatbread! These pictures are awesome. I don't know why but fiddleheads make me smile!